We have noticed that some drivers seem to have difficulties knowing what to do when being lapped, sometimes even trying to go out of track in an effort to let a quicker car pass and causing a dangerous situation. So here are some rules to make lapping and being lapped a much easier and simplier experience. The rules apply to BOTH lapped and lapping cars. Follow them and things will be much better! 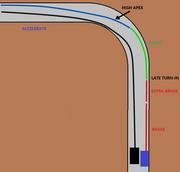 1) The lapping car executes the passing maneuver and its HIS responsability to do it safely. The lapped car must not hinder and if possible help, but nothing else. 2) The lapping car is quicker and got to the lapped car, so he CAN pass him. Don't make as lapped car things more complicated, he (or she ) is quicker than you, if you do the same things you have been doing so far, he will get by because he is quicker. So don't do anything unexpected like changing lanes, braking earlier, dropping speed at the exit of turn, etc. Follow your line, brake and accelerate as usual. 3) The best place to let a quicker car by is on a straight, moving as much as possible to the side and lifting slightly. NEVER braking or coasting as you might get rear-ended. 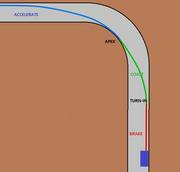 The second best is under braking at the entry of a turn (Graphical example later). 4) Passing lapped cars inside esses or quick changes in direction is NOT a good idea. It requires a good coordination between passing and passed car, and as a general rule is not adviced unless both drivers have high level and are well used to each other. 5) The passing car must try to keep a staggered position towards the lapped car, both to prevent hitting him and to make sure the lapped car is aware of him in the mirrors and peripheral vision. Now for some graphical examples of passing at corner entry. This is the typical line you follow on a corner when racing alone. You brake, turn-in and coast to the apex, then accelerate out of it. Now, when you have a quicker car behind you, what you want is to take the corner losing as little time as possible but at the same time giving the lapping car room to pass. That means you both have to share the corner, and here is what you have to change to achieve it. What you want to do is keep braking a little more (Extra braking) to a much later turn-in point, turn later hugging the outside of the corner, and apex at the center of the road (Because many times there might me more than one car coming and you don't want to shut the door on them), then accelerate out following the car(s) that just passed by. Note that the extra braking you do allows you to take the corner at slower speed, which is needed for the not-ideal line you are using (You don't use the full road), but the difference is not huge, and certainly not as much as if going to the gravel. Here is the sequence with both cars on track. (2) He is already parallel when you enter your extra braking zone. You do not turn in as you would hit him, but continue braking towards your late turn-in point. (5) Both come out of the corner accelerating at full gas. 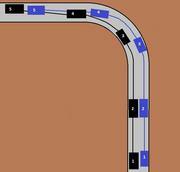 In some cases the lapping car might not have been able to complete the maneuver and you get to (4) in parallel or even forward of him. In that case, continue the line you took and simply short-shift some gears so that he has momentum to out-accelerate you. To make things even easier for the future, race control will indicate before each race the passing spots on the track for lapping and being lapped safely. Outside of those, the lapped car will have no obligation to do anything different, and the lapping car will overtake on his own responsability.